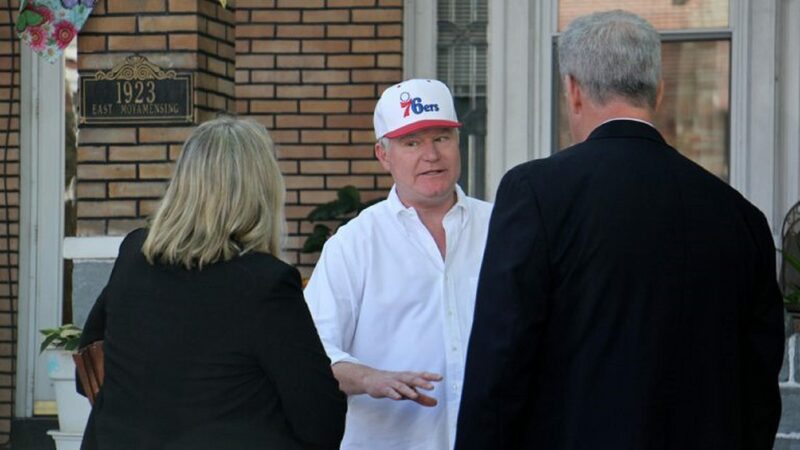 FILE PHOTO: Union boss John 'Johnny Doc' Dougherty outside of his home in South Philadelphia during an FBI raid in 2016. (Philadelphia) — Federal prosecutors in Philadelphia are expected on Wednesday to announce criminal charges against Local 98 of the International Brotherhood of Electrical Workers and the labor union’s leader, John Dougherty, closing a years-long corruption investigation into his business and personal dealings, according to federal law enforcement officials close to the probe. Dougherty, whose mighty labor union is one of the top contributors to Democrats in races at both the state and city level, has close ties to Philadelphia Mayor Jim Kenney. Dougherty has been under investigation for more than two years by federal authorities. In 2016, the FBI raided his home, the union’s headquarters, the South Philly bar he owns, and a number of other locations, including the office of City Councilman Bobby Henon, the union’s former political director. Dougherty’s brother, Kevin, is a Pennsylvania Supreme Court justice elected in 2015 with major support from Local 98. Federal authorities who were not authorized to speak publicly would not confirm how many others will be charged on Wednesday, but the indictment is anticipated to include numerous defendants. When reached by phone, Dougherty, widely known as “Johnny Doc,” said if he is charged on Wednesday, it would be news to him. 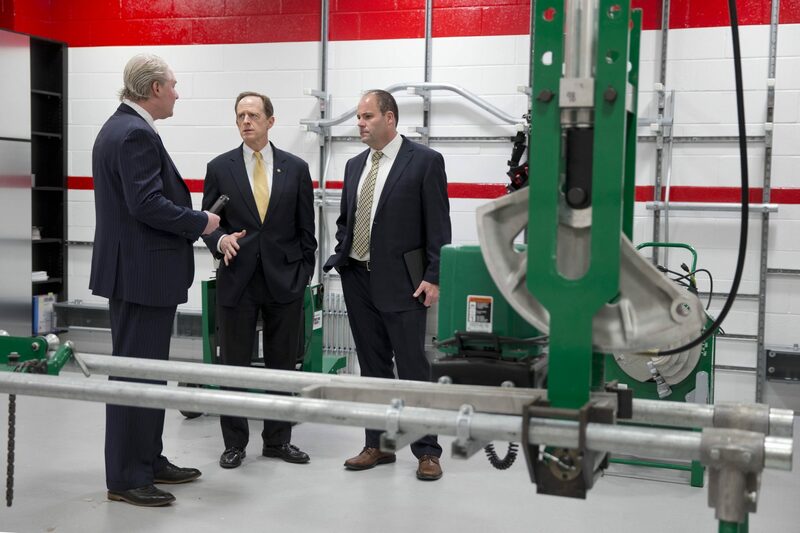 FILE PHOTO: Sen. Pat Toomey, R-Pa., center, accompanied by training director, Michael Neill, right, and business manager John Dougherty, tours the International Brotherhood of Electrical Workers union local 98’s Apprentice Training for the Electrical Industry facility, Thursday, Feb. 20, 2014, in Philadelphia. Henry Hockeimer, Dougherty’s lawyer, did not return calls for comment. It marked the first charges brought by federal prosecutors in its investigation into Dougherty and Local 98, but the court documents suggested Peltz did not provide information to authorities that would have assisted their wider examination of Dougherty and Peltz has not agreed to be used as a government witness in the case against the politically powerful labor union. Late Tuesday, federal prosecutors unsealed a 21-count indictment against James Moylan, Dougherty’s chiropractor and former Zoning Board of Adjustment member who was appointed by Kenney. He resigned after FBI agents raided his home and office in 2016. In the charging papers, the government alleges that Moylan stole more than $45,000 from Local 98. Prosecutors say Local 98 donated the money to a nonprofit Moylan controlled, but instead of devoting it to charity, Moylan allegedly spent the money on his mortgage and “meals, travel and golf,” authorities say. The political influence of Local 98 across Pennsylvania is immense. It has spent tens of millions through political action committees and independent expenditure groups over the years. The union’s spending provided major momentum to Kenney’s campaign in 2015, as well as Kevin Dougherty’s successful bid for the state’s top court. John Dougherty has also been a significant backer of Gov. Tom Wolf. Dougherty, who has been the subject of a previous FBI investigation that did not result in criminal charges, oversees nearly 5,000 electric workers, including the audio engineers who work at WHYY. Known in Philadelphia political circles for his brash, plainspoken approach, Dougherty also is said to have a combustible temper. In addition to digging into his personal and business spending, investigators have been looking at a 2014 incident in South Philly at a construction site in which Dougherty and a non-union contractor exchanged blows, though both sides dispute who first provoked the altercation. The Philadelphia Inquirer reported Tuesday that Dougherty repaid his union $280,000 last year, cash he accidentally used over six years to cover personal expenses and legal fees. The paper reported that the payment, discovered in a late-filed statement to the U.S. Department of Labor, occurred just as federal investigators began closing in on questions over whether Dougherty and Local 98 have been improperly using union money. Keystone Crossroads is a statewide reporting collaborative of WITF, WPSU and WESA, led by WHYY. This story originally appeared at https://whyy.org/programs/keystone-crossroads/. Disclosure: The Electricians Union Local 98 represents engineers at WHYY.